Now that we’re clearly heading deep into our autumn of apples, I wanted to make something that would celebrate apples without a lot of the extra embellishments of pastry dough or cake, although those will certainly come later in these pages. This recipe today takes its cue from a savory potato dish known as Hasselback Potatoes. I’ve applied the technique of making thin slices to create little grooves of potato to our noble apple. Each peeled and cored apple half gets scored with thin cuts and then brushed with a mix of melted butter, brown sugar and cinnamon. There’s a nice slow bake in a covered pan to elicit the juices of the apple and coax them to co-mingle with the baste. Then a second reinforcement topping is applied that consists of more butter, brown sugar and cinnamon along with just a bit of oatmeal and flour and a pinch of salt. Back they go into the oven for an additional 10 minutes to melt that into a dizzying delicious sauce. Oh. My. Goodness. 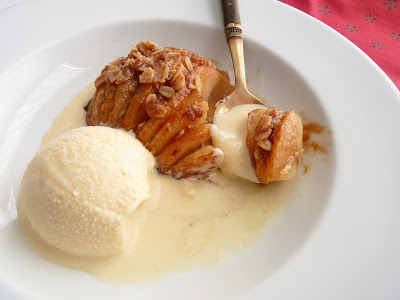 This turned out to be a really fantastic dessert, a perfect balance of flavors and textures. 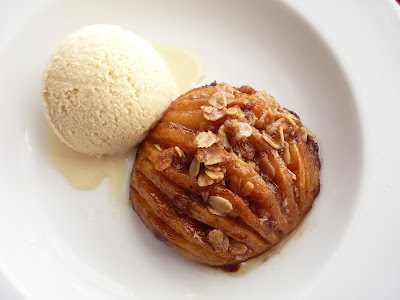 It’s served warm with a scoop of ice cream and the whole thing just makes me thank the universe for apples. The brown sugar, cinnamon and butter caramelize into perfection as the apples soften but still have just enough bite to escape the fate of being mushy. There’s also a very slight chewiness to the topping that enhances all the flavors dancing together in total bliss. As the ice cream starts to melt and enrobe each luscious bite, you realize you’ve reached apple pastry nirvana. This is way too easy and way too delicious not to be served at your next opportunity. Invite your friends and impress them with your genius. 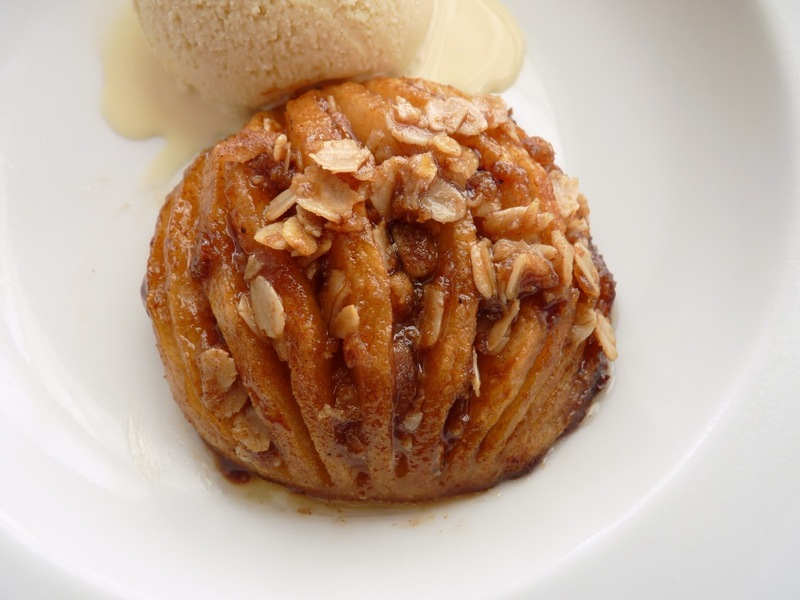 Apple lovers, let’s all swoon in unison! - I used Gala apples. Choose similar apples that are firm and crisp, such as Pink Lady or Honeycrisp. The recipe indicates that Granny Smith and Fujis didn’t hold up. - A corer makes the job of coring the apples very easy. - I don’t recommend using a larger baking dish. You don’t want the juices to boil down and burn. If they begin to do so, add just a splash of apple juice or water. - When you remove the foil, take the pan out of the oven and lift the covering so that the steam escapes away from you. Steam burns really do hurt. - The topping includes 1/4 teaspoon kosher salt, which is slightly less harsh than table salt. If you want to use table salt, use a scant 1/4 teaspoon. - There’s a Cooking Light video of the preparation although there seem to be some slightly different amounts listed for the ingredients for some odd reason. I followed the recipe at their link below. - The recipe has as one last step putting the apples under the broiler for an additional 2 minutes. I didn’t find that necessary at all. If you decide to do that, make sure your baking pan is safe for broiling. 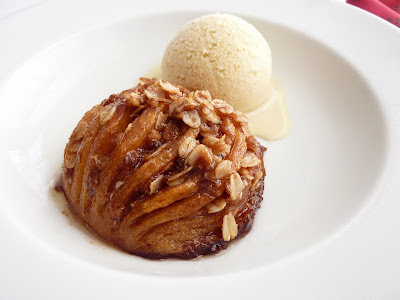 - I served my apples with Whiskey Ice Cream. Really incredible. Of course, Vanilla and Caramel Ice Cream would also certainly be great. - More simple apple goodness: Apple Dumplings and Apple Brown Betty. Preheat oven to 400 degrees F. Lightly grease an 8” square baking dish. Peel and core the apples, then cut them in half vertically. Starting at the outermost edges, cut most (but not all) of the way through each apple half at about 1/8” intervals. Place apple halves, cored sides down, in the baking dish. Combine 1 tablespoon brown sugar, 1 tablespoon melted butter, and ½ teaspoon cinnamon and brush the mixture evenly over each apple half. Cover the pan with foil. Bake 20 minutes. Remove the pan from the oven and carefully lift off the foil. Return to the oven and bake for 10 additional minutes uncovered. Remove pan from oven. Combine remaining 3 tablespoons brown sugar, 1 1/2 tablespoons melted butter, 1/4 teaspoon cinnamon, oats, flour and salt. Carefully fan open the cuts in the apple halves. Spoon the oat mixture evenly over the apples, pressing some of it into the grooves. Bake 10 minutes uncovered. Remove from oven. Serve warm with ice cream. I've got more apples than we can begin to eat, and I'm avoiding flour at the moment, so this is perfect and of-the-moment. I'm going to swap the topping for something crunchier- a pre-toasted oat cinnamon granola-ish streuselly thing I can sprinkle on right before serving to maintain the crisp contrast. And, I'll use my old favorite brown sugar molasses ice cream. There are quite a few fun possibilities with this idea. Thank you for sharing it! Pam, that sounds good but be sure not to skimp on the second butter and brown sugar basting. It lends a degree of moisture and flavor that really makes the dish. Hope you enjoy. I saw these in Cooking Light and put it on my to-do list. I was going to get some apples at a local orchard this weekend. Since you made them, I know a) they must be delicious, and b) I'm starting with your recipe and not theirs. Yum! Beth, do make these apples and savor every bite. I think you'll find them as delicious as I did.